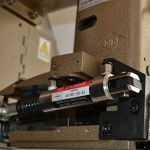 Automatic single needle machine for both plain and crepe-tape bound closing of all kinds of filled bags. The machine will start and stop automatically by a micro-switch lever or photoelectric switch (has to be provided) actuated by the bag being fed into the machine. In the same way, the machine stops after the bag passes through, and at the same time the thread/crepe-tape is cut automatically by built-in air cylinder operated guillotine type cutter. Cutter: pneumatic cutter for thread and Crepe tape. This needle is also used in the following other related Bag Sewing Machines. This entry was posted in Uncategorized and tagged newlong ds6ac. Bookmark the permalink.